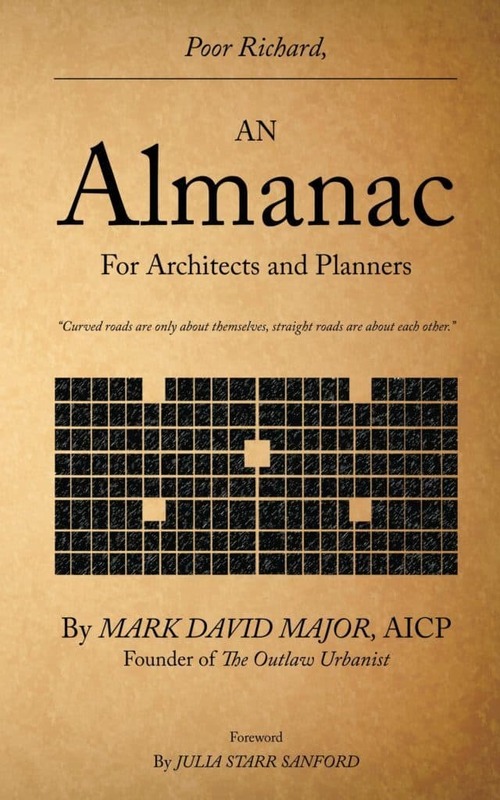 A version of Poor Richard, Yet Another Almanac for Architects and Planners (Volume 3) specifically tailored for Kindle devices is available for purchase from the Kindle Store. Be sure to check the online store in your country/currency (USA store available below). 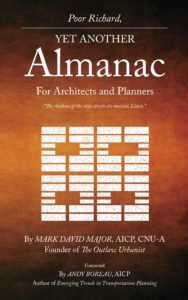 Praise for the first two volumes of the Poor Richard series of almanacs for architects and planners by Mark David Major: “worthwhile” and “thought-provoking” “readers will love” Poor Richard in “following both Benjamin Franklin and Ambrose Bierce” (Planning Magazine and Portland Book Review). Poor Richard, Yet Another Almanac for Architects and Planners (Volume 3) offers more common sense proverbs, astute observations, and general rules of thumbs about architecture, urban design, town planning, and much more in the third and final volume of the Poor Richard series. 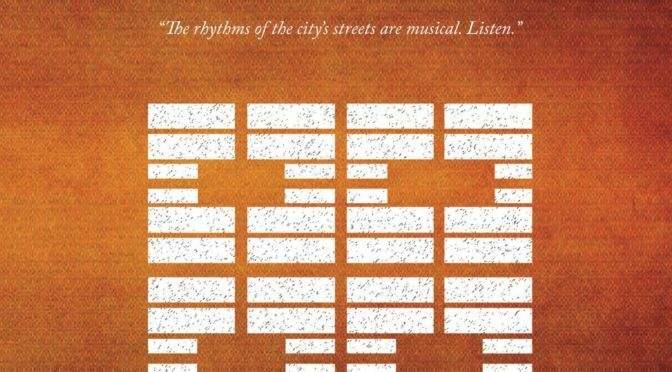 Author Mark David Major blends original ideas with adapted wisdom in an easy-to-read manner designed to spark deeper thought about hearth and home, streets and cities, and people and society. It is essential reading for anyone interested in the future of the built environment. Poor Richard’s witticisms are often eloquent, sometimes biting, occasionally opaque in the absence of reflection, and always insightful. They offer a valuable resource for the entire year. A clarion call and warning for everyone involved in the creation of our built environments to embrace their better angels and reject the worse demons of human nature. The clear message of Poor Richard, Yet Another Almanac for Architects and Planners (Volume 3), with foreword by Andy Boenau (author of Emerging Trends in Transportation Planning), is we can do better and we must do better for the built environment and our cities. The third and final volume of the Poor Richard series of almanacs for architects and planners is now available for purchase on Amazon, Kindle, CreateSpace, and other online retailers! Poor Richard, Yet Another Almanac for Architects and Planners (Volume 3 of the Poor Richard series) is available for purchase from CreateSpace, Amazon, Kindle, and other online retailers around the world. Be sure to check the online store in your country/currency (USA stores available below). (Planning Magazine and Portland Book Review). 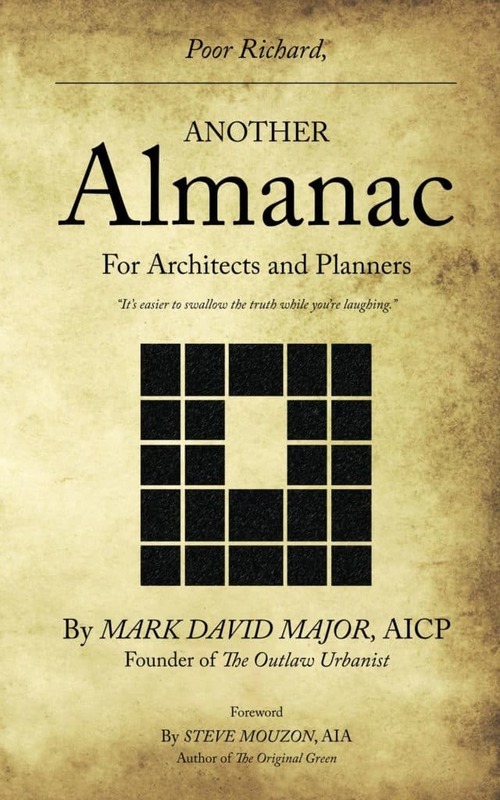 Poor Richard, Yet Another Almanac for Architects and Planners offers more common sense proverbs, astute observations, and general rules of thumbs about architecture, urban design, town planning, and much more in the third and final volume of the Poor Richard series. 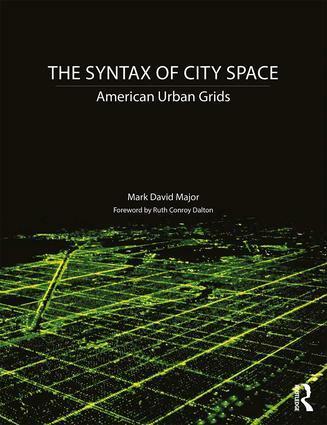 Author Mark David Major blends original ideas with adapted wisdom in an easy-to-read manner designed to spark deeper thought about hearth and home, streets and cities, and people and society. Poor Richard, Yet Another Almanac for Architects and Planners is essential reading for anyone interested in the future of the built environment. Poor Richard’s witticisms are often eloquent, sometimes biting, occasionally opaque in the absence of deeper reflection, and always insightful. They offer a valuable resource for the entire year, a clarion call and warning for everyone involved in the creation of our built environments to embrace their better angels and reject the worse demons of human nature. 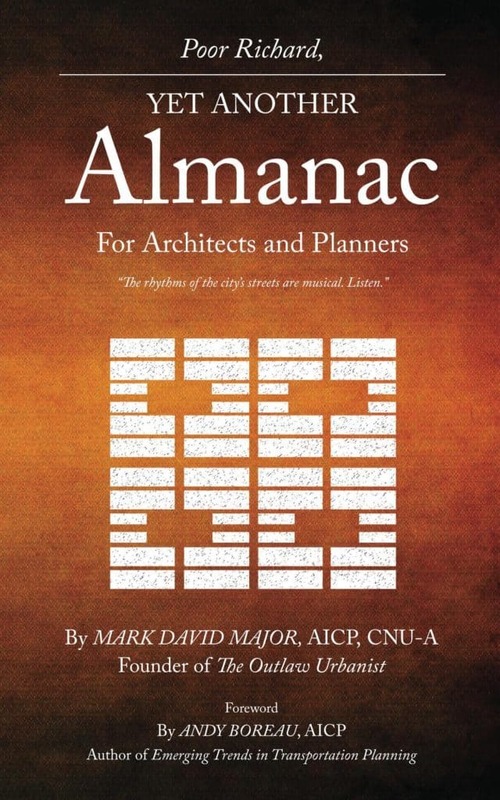 The clear message of Poor Richard, Yet Another Almanac for Architects and Planners, with foreword by Andy Boenau (author of Emerging Trends in Transportation Planning), is we can do better and we must do better for the built environment and our cities. Available soon from Amazon, CreateSpace, and the Kindle Store.